Omdat ik van een goede kennis een tegoedbon voor een boek gekregen had, heb ik toch maar eens ‘De Woorden en De Dingen’ van Foucault aangeschaft uit de Boom serie. Ik heb nog even staan twijfelen tussen Foucault en Merleau-Ponty, maar toch werd het Foucault. Het boek van Merleau-Ponty, ‘Fenomenologie van het waarnemen‘, schaf ik nog wel een andere keer aan. In elk geval, Foucault kennen we natuurlijk hier allemaal van het boekje ‘dit is geen pijp‘ waarin hij het schilderij ‘Het verraad van de afbeelding‘. Analyseert. Dat is natuurlijk een prima boekje. Maar het eerste hoofdstuk van het boek van Foucault is dus een super goede analyse van het werk zonder te vallen in anekdotische historische onderdelen. Het wordt puur benaderd vanuit wat dat beeld doet. Dat is best knap gedaan en daar hebben we hier dan ook veel waardering voor. Helaas heb ik van de tekst alleen een Engelse versie kunnen vinden op het web. Het geheel overtypen leek me iets te veel van het goede. Succes dus met het lezen in het Engels, en anders gewoon die prachtuitgave van Boom kopen. The painter is standing a little back from his canvas. He is glancing at his model; perhaps he is considering whether to add some finishing touch, though it is also possible that the first stroke has not yet been made. The arm holding the brush is bent to the left, towards the palette; it is motionless, for an instant, between canvas and paints. The skilled hand is suspended in mid-air, arrested in rapt attention on the painter’s gaze; and the gaze, in return, waits upon the arrested gesture. Between the fine point of the brush and the steely gaze, the scene is about to yield up its volume. But not without a subtle system of feints. By standing back a little, the painter has placed himself to one side of the painting on which he is working. That is, for the spectator at present observing him he is to the right of his canvas, while the latter, the canvas, takes up the whole of the extreme left. And the canvas has its back turned to that spectator: he can see nothing of it but the reverse side, together with the huge frame on which it is stretched. The painter, on the other hand, is perfectly visible in his full height; or at any rate, he is not masked by the tall canvas which may soon absorb him, when, taking a step towards it again, he returns to his task; he has no doubt just appeared, at this very instant, before the eyes of the spectator, emerging from what is virtually a sort of vast cage projected backwards by the surface he is painting. Now he can be seen, caught in a moment of stillness, at the neutral centre of this oscillation. His dark torso and bright face are half-way between the visible and the invisible: emerging from that canvas beyond our view, he moves into our gaze; but when, in a moment, he makes a step to the right, removing himself from our gaze, he will be standing exactly in front of the canvas he is painting; he will enter that region where his painting, neglected for an instant, will, for him, become visible once more, free of shadow and free of reticence. As though the painter could not at the same time be seen on the picture where he is represented and also see that upon which he is representing something. He rules at the threshold of those two incompatible visibilities. The painter is looking, his face turned slightly and his head leaning towards one shoulder. He is staring at a point to which, even though it is invisible, we, the spectators, can easily assign an object, since it is we, ourselves, who are that point: our bodies, our faces, our eyes. The spectacle he is observing is thus doubly invisible: first, because it is not represented within the space of the painting, and, second, because it is situated precisely in that blind point, in that essential hiding-place into which our gaze disappears from ourselves at the moment of our actual looking. And yet, how could we fail to see that invisibility, there in front of our eyes, since it has its own perceptible equivalent, its sealed-in figure, in the painting itself? We could, in effect, guess what it is the painter is looking at if it were possible for us to glance for a moment at the canvas he is working on; but all we can see of that canvas is its texture, the horizontal and vertical bars of the stretcher, and the obliquely rising foot of the easel. The tall, monotonous rectangle occupying the whole left portion of the real picture, and representing the back of the canvas within the picture, reconstitutes in the form of a surface the invisibility in depth of what the artist is observing: that space in which we are, and which we are. From the eyes of the painter to what he is observing there runs a compelling line that we, the onlookers, have no power of evading: it runs through the real picture and emerges from its surface to join the place from which we see the painter observing us; this dotted line reaches out to us ineluctably, and links us to the representation of the picture. In appearance, this locus is a simple one; a matter of pure reciprocity: we are looking at a picture in which the painter is in turn looking out at us. A mere confrontation, eyes catching one another’s glance, direct looks superimposing themselves upon one another as they cross. And yet this slender line of reciprocal visibility embraces a whole complex network of uncertainties, exchanges, and feints. The painter is turning his eyes towards us only in so far as we happen to occupy the same position as his subject. We, the spectators, are an additional factor. Though greeted by that gaze, we are also dismissed by it, replaced by that which was always there before we were: the model itself. But, inversely, the painter’s gaze, addressed to the void confronting him outside the picture, accepts as many models as there are spectators; in this precise but neutral place, the observer and the observed take part in a ceaseless exchange. No gaze is stable, or rather in the neutral furrow of the gaze piercing at a right angle through the canvas, subject and object, the spectator and the model, reverse their roles infinity. And here the great canvas with its back to us on the extreme left of the picture exercises its second function: stubbornly invisible, it prevents the relation of these gazes from ever being discoverable or definitely established. The opaque fixity that it establishes on one side renders forever unstable the play of metamorphoses established in the centre between spectator and model. Because we can see only that reverse side, we do not know who we are, or what we are doing. Seen or seeing? The painter is observing a place which, from moment to moment, never ceases to change its content, its form, its face, its identity. But the attentive immobility of his eyes refers us back to another direction which they have often followed already, and which soon, there can be no doubt, they will take again: that of the motionless canvas upon which is being traced, has already been traced perhaps, for a long time and forever, a portrait that will never again be erased. So that the painter’s sovereign gaze commands a virtual triangle whose outline defines this picture of a picture: at the top – the only visible corner – the painter’s eyes; at one of the base angles, the invisible place occupied by the model; at the other base angle, the figure probably sketched out on the invisible surface of the canvas. spectators, as the other is solitary (for no one is looking at it, not even the painter). From the right, there streams in through an invisible window the pure volume of a light that renders all representation visible; to the left extends the surface that conceals, on the other side of its all too visible woven texture, the representation it bears. The light, by flooding the scene (I mean the room as well as the canvas, the room represented on the canvas, and the room in which the canvas stands), envelops the figures and the spectators and carries them with it, under the painter’s gaze, towards the place where his brush will represent them. But that place is concealed from us. We are observing ourselves being observed by the painter, and made visible to his eyes by the same light that enables us to see him. And just as we are about to apprehend ourselves, transcribed by his hand as though in a mirror, we find that we can in fact apprehend nothing of that mirror but its lustreless back. The other side of a psyche. Now, as it happens, exactly opposite the spectators – ourselves – on the wall forming the far end of the room, Velázquez has represented a series of pictures; and we see that among all those hanging canvases there is one that shines with particular brightness. Its frame is wider and darker than those of the others; yet there is a fine white line around its inner edge diffusing over its whole surface a light whose source is not easy to determine; for it comes from nowhere, unless it be from a space within itself. In this strange light, two silhouettes are apparent, while above them, and a little behind them, is a heavy purple curtain. The other pictures reveal little more than a few paler patches buried in a darkness without depth. This particular one, on the other hand, opens onto a perspective of space in which recognizable forms recede from us in a light that belongs only to itself. Among all these elements intended to provide representations, while impeding them, hiding them, concealing them because of their position or their distance from us, this is the only one that fulfils its function in all honesty and enables us to see what it is supposed to show. Despite its distance from us, despite the shadows all around it. But it isn’t a picture: it is a mirror. It offers us at last that enchantment of the double that until now has been denied us, not only by the distant paintings but also by the light in the foreground with its ironic canvas. Of all the representations represented in the picture this is the only one visible; but no one is looking at it. Upright beside his canvas, his attention entirely taken up by his model, the painter is unable to see this looking-glass shining so softly behind him. The other figures in the picture are also, for the most part, turned to face what must be taking place in front -towards the bright invisibility bordering the canvas, towards that balcony of light where their eyes can gaze at those who are gazing back at them, and not towards that dark recess which marks the far end of the room in which they are represented. There are, it is true, some heads turned away from us in profile: but not one of them is turned far enough to see, at the back of the room, that solitary mirror, that tiny glowing rectangle which is nothing other than visibility, yet without any gaze able to grasp it, to render it actual, and to enjoy the suddenly ripe fruit of the spectacle it offers. It must be admitted that this indifference is equalled only by the mirror’s own. It is reflecting nothing, in fact, of all that is there in the same space as itself: neither the painter with his back to it, nor the figures in the centre of the room. It is not the visible it reflects, in those bright depths. In Dutch painting it was traditional for mirrors to play a duplicating role: they repeated the original contents of the picture, only inside an unreal, modified, contracted, concave space. One saw in them the same things as one saw in the first instance in the painting, but decomposed and re-composed according to a different law. Here, the mirror is saying nothing that has already been said before. Yet its position is more or less completely central: its upper edge is exactly on an imaginary line running half-way between the top and the bottom of the painting, it hangs right in the middle of the far wall (or at least in the middle of the portion we can see); it ought, therefore, to be governed by the same lines of perspective as the picture itself; we might well expect the same studio, the same painter, the same canvas to be arranged within it according to an identical space; it could be the perfect duplication. In fact, it shows us nothing of what is represented in the picture itself. Its motionless gaze extends out in front of the picture, into that necessarily invisible region which forms its exterior face, to apprehend the figures arranged in that space. Instead of surrounding visible objects, this mirror cuts straight through the whole field of the representation, ignoring all it might apprehend within that field, and restores visibility to that which resides outside all view. But the invisibility that it overcomes in this way is not the invisibility of what is hidden: it does not make its way around any obstacle, it is not distorting any perspective, it is addressing itself to what is invisible both because of the picture’s structure and because of its existence as painting. What it is reflecting is that which all the figures within the painting are looking at so fixedly, or at least those who are looking straight ahead; it is therefore what the spectator would be able to see if the painting extended further forward, if its bottom edge were brought lower until it included the figures the painter is using as models. But it is also, since the picture does stop there, displaying only the painter and his studio, what is exterior to the picture, in so far as it is a picture – in other words, a rectangular fragment of lines and colours intended to represent something to the eyes of any possible spectator. At the far end of the room, ignored by all, the unexpected mirror holds in its glow the figures that the painter is looking at (the painter in his represented, objective reality, the reality of the painter at his work); but also the figures that are looking at the painter (in that material reality which the lines and the colours have laid out upon the canvas). These two groups of figures are both equally inaccessible, but in different ways: the first because of an effect of composition peculiar to the painting; the second because of the law that presides over the very existence of all pictures in general. Here, the action of representation consists in bringing one of these two forms of invisibility into the place of the other, in an unstable superimposition – and in rendering them both, at the same moment, at the other extremity of the picture – at that pole which is the very height of its representation: that of a reflected depth in the far recess of the painting’s depth. The mirror provides a metathesis of visibility that affects both the space represented in the picture and its nature as representation; it allows us to see, in the centre of the canvas, what in the painting is of necessity doubly invisible. But perhaps it is time to give a name at last to that image which appears in the depths of the mirror, and which the painter is contemplating in front of the picture. Perhaps it would be better, once and for all, to determine the identities of all the figures presented or indicated here, so as to avoid embroiling ourselves forever in those vague, rather abstract designations, so constantly prone to misunderstanding and duplication, ‘the painter’, ‘the characters’, ‘the models’, ‘the spectators’, ‘the images’. Rather than pursue to infinity a language inevitably inadequate to the visible fact, it would be better to say that Velázquez composed a picture; that in this picture he represented himself, in his studio or in a room of the Escurial, in the act of painting two figures whom the Infanta Margarita has come there to watch, together with an entourage of duennas, maids of honour, courtiers, and dwarfs; that we can attribute names to this group of people with great precision: tradition recognizes that here we have Doña Maria Agustina Sarmiente, over there Nieto, in the foreground Nicolaso Pertusato, an Italian jester. We could then add that the two personages serving as models to the painter are not visible, at least directly; but that we can see them in a mirror; and that they are, without any doubt, King Philip IV and his wife, Mariana. These proper names would form useful landmarks and avoid ambiguous designations; they would tell us in any case what the painter is looking at, and the majority of the characters in the picture along with him. But the relation of language to painting is an infinite relation. It is not that words are imperfect, or that, when confronted by the visible, they prove insuperably inadequate. Neither can be reduced to the other’s terms: it is in vain that we say what we see; what we see never resides in what we say. And it is in vain that we attempt to show, by the use of images, metaphors, or similes, what we are saying; the space where they achieve their splendour is not that deployed by our eyes but that defined by the sequential elements of syntax. And the proper name, in this particular context, is merely an artifice: it gives us a finger to point with, in other words, to pass surreptitiously from the space where one speaks to the space where one looks; in other words, to fold one over the other as though they were equivalents. But if one wishes to keep the relation of language to vision open, if one wishes to treat their incompatibility as a starting-point for speech instead of as an obstacle to be avoided, so as to stay as close possible to both, then one must erase those proper names and preserve the infinity of the task. It is perhaps through the medium of this grey, anonymous language, always overmeticulous and repetitive because too broad, that the painting may, little by little, release its illuminations. We must therefore pretend not to know who is to be reflected in the depths of that mirror, and interrogate that reflection in its own terms. First, it is the reverse of the great canvas represented on the left. The reverse, or rather the right side, since it displays in full face what the canvas, by its position, is hiding from us.Furthermore, it is both in opposition to the window and a reinforcement of it. Like the window, it provides a ground which is common to the painting and to what lies outside it. But the window operates by the continuous movement of an effusion which, flowing from right to left, unites the attentive figures, the painter, and the canvas, with the spectacle they are observing; whereas the mirror, on the other hand, by means of a violent, instantaneous movement, a movement of pure surprise, leaps out from the picture in order to reach that which is observed yet invisible in front of it, and then, at the far end of its fictitious depth, to render it visible yet indifferent to every gaze. The compelling tracer line, joining the reflection to that which it is reflecting, cuts perpendicularly through the lateral flood of light. Lastly – and this is the mirror’s third function – it stands adjacent to a doorway which forms an opening, like the mirror itself, in the far wall of the room. This doorway too forms a bright and sharply defined rectangle whose soft light does not shine through into the room. It would be nothing but a gilded panel if it were not recessed out from the room by means of one leaf of a carved door, the curve of a curtain, and the shadows of several steps. Beyond the steps, a corridor begins; but instead of losing itself in obscurity, it is dissipated in a yellow dazzle where the light, without coming in, whirls around on itself in dynamic repose. Against this background, at once near and limitless, a man stands out in full-length silhouette; he is seen in profile; with one hand he is holding back the weight of a curtain; his feet are placed on different steps; one knee is bent. He may be about to enter the room; or he may be merely observing what is going on inside it, content to surprise those within without being seen himself. Like the mirror, his eyes are directed towards the other side of the scene; nor is anyone paying any more attention to him than to the mirror. We do not know where he has come from: it could be that by following uncertain corridors he has just made his way around the outside of the room in which these characters are collected and the painter is at work; perhaps he too, a short while ago, was there in the forefront of the scene, in the invisible region still being contemplated by all those eyes in the picture. Like the images perceived in the looking-glass, it is possible that he too is an emissary from that evident yet hidden space. Even so, there is a difference: he is there in flesh and blood; he has appeared from the outside, on the threshold of the area represented; he is indubitable – not a probable reflection but an irruption. The mirror, by making visible, beyond even the walls of the studio itself, what is happening in front of the picture, creates, in its sagittal dimension, an oscillation between the interior and the exterior. One foot only on the lower step, his body entirely in profile, the ambiguous visitor is coming in and going out at the same time, like a pendulum caught at the bottom of its swing. He repeats on the spot, but in the dark reality of his body, the instantaneous movement of those images flashing across the room, plunging into the mirror, being reflected there, and springing out from it again like visible, new, and identical species. Pale, minuscule, those silhouetted figures in the mirror are challenged by the tall, solid stature of the man appearing in the doorway. But we must move down again from the back of the picture towards the front of the stage; we must leave that periphery whose volute we have just been following. Starting from the painter’s gaze, which constitutes an off-centre centre to the left, we perceive first of all the back of the canvas, then the paintings hung on the wall, with the mirror in their centre, then the open doorway, then more pictures, of which, because of the sharpness of the perspective, we can see no more than the edges of the frames, and finally, at the extreme right, the window, or rather the groove in the wall from which the light is pouring. This spiral shell presents us with the entire cycle of representation: the gaze, the palette and brush, the canvas innocent of signs (these are the material tools of representation), the paintings, the reflections, the real man (the completed representation, but as it were freed from its illusory or truthful contents, which are juxtaposed to it); then the representation dissolves again: we can see only the frames, and the light that is flooding the pictures from outside, but that they, in return, must reconstitute in their own kind, as though it were coming from elsewhere, passing through their dark wooden frames. And we do, in fact, see this light on the painting, apparently welling out from the crack of the frame; and from there it moves over to touch the brow, the cheekbones, the eyes, the gaze of the painter, who is holding a palette in one hand and in the other a fine brush . . . And so the spiral is closed, or rather, by means of that light, is opened. This opening is not, like the one in the back wall, made by pulling back a door; it is the whole breadth of the picture itself, and the looks that pass across it are not those of a distant visitor. The frieze that occupies the foreground and the middle ground of the picture represents – if we include the painter – eight characters. Five of these, their heads more or less bent, turned or inclined, are looking straight out at right angles to the surface of the picture. The centre of the group is occupied by the little Infanta, with her flared pink and gray dress. The princess is turning her head towards the right side of the picture, while her torso and the big panniers other dress slant away slightly towards the left; but her gaze is directed absolutely straight towards the spectator standing in front of the painting. A vertical line dividing the canvas into two equal halves would pass between the child’s eyes. Her face is a third of the total height of the picture above the lower frame. So that here, beyond all question, resides the principal theme of the composition; this is the very object of this painting. As though to prove this and to emphasize it even more, Velázquez has made use of a traditional visual device: beside the principal figure he has placed a secondary one, kneeling and looking in towards the central one. Like a donor in prayer, like an angel greeting the Virgin, a maid of honour on her knees is stretching out her hands towards the princess. Her face stands out in perfect profile against the background. It is at the same height as that of the child. This attendant is looking at the princess and only at the princess. A little to the right, there stands another maid of honour, also turned towards the Infanta, leaning slightly over her, but with her eyes clearly directed towards the front, towards the same spot already being gazed at by the painter and the princess. Lastly, two other groups made up of two figures each: one of these groups is further away; the other, made up of the two dwarfs, is right in the foreground. One character in each of these pairs is looking straight out, the other to the left or the right. Because of their positions and their size, these two groups correspond and themselves form a pair: behind, the courtiers (the woman, to the left, looks to the right); in front, the dwarfs (the boy, who is at the extreme right, looks in towards the centre of the picture). This group of characters, arranged in this manner, can be taken to constitute, according to the way one looks at the picture and the centre of reference chosen, two different figures. The first would be a large X: the top left-hand point of this X would be the painter’s eyes; the top right-hand one, the male courtier’s eyes; at the bottom left-hand comer there is the comer of the canvas represented with its back towards us (or, more exactly, the foot of the easel); at the bottom right-hand corner, the dwarf (his foot on the dog’s back). Where these two lines intersect, at the centre of the X, are the eyes of the Infanta. The second figure would be more that of a vast curve, its two ends determined by the painter on the left and the male courtier on the right – both these extremities occurring high up in the picture and set back from its surface; the centre of the curve, much nearer to us, would coincide with the princess’s face and the look her maid of honour is directing towards her. This curve describes a shallow hollow across the centre of the picture which at once contains and sets off the position of the mirror at the back. There are thus two centres around which the picture may be organized, according to whether the fluttering attention of the spectator decides to settle in this place or in that. The princess is standing upright in the centre of a St Andrew’s cross, which is revolving around her with its eddies of courtiers, maids of honour, animals, and fools. But this pivoting movement is frozen. Frozen by a spectacle that would be absolutely invisible if those same characters, suddenly motionless, were not offering us, as though in the hollow of a goblet, the possibility of seeing in the depths of a mirror the unforeseen double of what they are observing. In depth, it is the princess who is superimposed on the mirror; vertically, it is the reflection that is superimposed on the face. But, because of the perspective, they are very close to one another. Moreover, from each of them there springs an ineluctable line: the line issuing from the mirror crosses the whole of the depth represented (and even more, since the mirror forms a hole in the back wall and brings a further space into being behind it); the other line is shorter: it comes from the child’s eyes and crosses only the foreground. These two sagittal lines converge at a very sharp angle, and the point where they meet, springing out from the painted surface, occurs in front of the picture, more or less exactly at the spot from which we are observing it. It is an uncertain point because we cannot see it; yet it is an inevitable and perfectly defined point too, since it is determined by those two dominating figures and confirmed further by other, adjacent dotted lines which also have their origin inside the picture and emerge from it in a similar fashion. What is there, then, we ask at last, in that place which is completely inaccessible because it is exterior to the picture, yet is prescribed by all the lines of its composition? What is the spectacle, what are the faces that are reflected first of all in the depths of the Infanta’s eyes, then in the courtiers’ and the painter’s, and finally in the distant glow of the mirror? But the question immediately becomes a double one: the face reflected in the mirror is also the face that is contemplating it; what all the figures in the picture are looking at are the two figures to whose eyes they too present a scene to be observed. The entire picture is looking out at a scene for which it is itself a scene. A condition of pure reciprocity manifested by the observing and observed mirror, the two stages of which are uncoupled at the two lower corners of the picture: on the left the canvas with its back to us, by means of which the exterior point is made into pure spectacle; to the right the dog lying on the floor, the only element in the picture that is neither looking at anything nor moving, because it is not intended, with its deep reliefs and the light playing on its silky hair, to be anything but an object to be seen. Our first glance at the painting told us what it ‘is’ that creates this spectacle-asobservation. It is the two sovereigns. One can sense their presence already in the respectful gaze of the figures in the picture, in the astonishment of the child and the dwarfs. We recognize them, at the far end of the picture, in the two tiny silhouettes gleaming out from the looking-glass. In the midst of all those attentive faces, all those richly dressed bodies, they are the palest, the most unreal, the most compromised of all the painting’s images: a movement, a little light, would be sufficient to eclipse them. Of all these figures represented before us, they are also the most ignored, since no one is paying the slightest attention to that reflection which has slipped into the room behind them all, silently occupying its unsuspected space; in so far as they are visible, they are the frailest and the most distant form of all reality. Inversely, in so far as they stand outside the picture and are therefore withdrawn from it in an essential invisibility, they provide the centre around which the entire representation is ordered: it is they who are being faced, it is towards them that everyone is turned, it is to their eyes that the princess is being presented in her holiday clothes; from the canvas with its back to us to the Infanta, and from the Infanta to the dwarf playing on the extreme right, there runs a curve (or again, the lower fork of the X opens) that orders the whole arrangement of the picture to their gaze and thus makes apparent the true centre of the composition, to which the Infanta’s gaze and the image in the mirror are both finally subject. In the realm of the anecdote, this centre is symbolically sovereign, since it is occupied by King Philip IV and his wife. But it is so above all because of the triple function it fulfils in relation to the picture. For in it there occurs an exact superimposition of the model’s gaze as it is being painted, of the spectator’s as he contemplates the painting, and of the painter’s as he is composing his picture (not the one represented, but the one in front of us which we are discussing). These three ‘observing’ functions come together in a point exterior to the picture: that is, an ideal point in relation to what is represented, but a perfectly real one too, since it is also the starting-point that makes the representation possible. Within that reality itself, it cannot not be invisible. And yet, that reality is projected within the picture – projected and diffracted in three forms which correspond to the three functions of that ideal and real point. 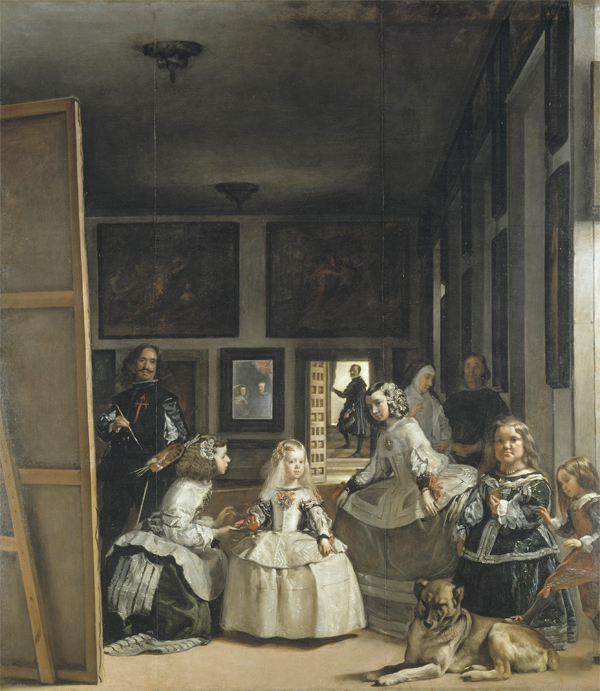 They are: on the left, the painter with his palette in his hand (a self-portrait of Velázquez); to the right, the visitor, one foot on the step, ready to enter the room; he is taking in the scene from the back, but he can see the royal couple, who are the spectacle itself, from the front; and lastly, in the centre, the reflection of the king and the queen, richly dressed, motionless, in the attitude of patient models. A reflection that shows us quite simply, and in shadow, what all those in the foreground are looking at. It restores, as if by magic, what is lacking in every gaze: in the painter’s, the model, which his represented double is duplicating over there in the picture; in the king’s, his portrait, which is being finished off on that slope of the canvas that he cannot perceive from where he stands; in that of the spectator, the real centre of the scene, whose place he himself has taken as though by usurpation. But perhaps this generosity on the part of the mirror is feigned; perhaps it is hiding as much as and even more than it reveals. That space where the king and his wife hold sway belongs equally well to the artist and to the spectator: in the depths of the mirror there could also appear – there ought to appear – the anonymous face of the passer-by and that of Velázquez. For the function of that reflection is to draw into the interior of the picture what is intimately foreign to it: the gaze which has organized it and the gaze for which it is displayed. But because they are present within the picture, to the right and to the left, the artist and the visitor cannot be given a place in the mirror: just as the king appears in the depths of the looking-glass precisely because he does not belong to the picture. In the great volute that runs around the perimeter of the studio, from the gaze of the painter, with his motionless hand and palette, right round to the finished paintings, representation came into being, reached completion, only to dissolve once more into the light; the cycle was complete. The lines that run through the depth of the picture, on the other hand, are not complete; they all lack a segment of their trajectories. This gap is caused by the absence of the king – an absence that is an artifice on the part of the painter. But this artifice both conceals and indicates another vacancy which is, on the contrary, immediate: that of the painter and the spectator when they are looking at or composing the picture. It may be that, in this picture, as in all the representations of which it is, as it were, the manifest essence, the profound invisibility of what one sees is inseparable from the invisibility of the person seeing – despite all mirrors, reflections, imitations, and portraits. Around the scene are arranged all the signs and successive forms of representation; but the double relation of the representation to its model and to its sovereign, to its author as well as to the person to whom it is being offered, this relation is necessarily interrupted. It can never be present without some residuum, even in a representation that offers itself as a spectacle. In the depth that traverses the picture, hollowing it into a fictitious recess and projecting it forward in front of itself, it is not possible for the pure felicity of the image ever to present in a full light both the master who is representing and the sovereign who is being represented. Perhaps there exists, in this painting by Velázquez, the representation as it were, of Classical representation, and the definition of the space it opens up to us. And, indeed, representation undertakes to represent itself here in all its elements, with its images, the eyes to which it is offered, the faces it makes visible, the gestures that call it into being. But there, in the midst of this dispersion which it is simultaneously grouping together and spreading out before us, indicated compellingly from every side, is an essential void: the necessary disappearance of that which is its foundation – of the person it resembles and the person in whose eyes it is only a resemblance. This very subject – which is the same – has been elided. And representation, freed finally from the relation that was impeding it, can offer itself as representation in its pure form.